I used a really thick textured watercolor paper (Shizen WC paper). The butterflies were made with a Memory Box Die called Leavenworth Butterfly Trio. I found the sentiment on a stamp set called Flower Fusion #1 by Papertrey Ink. 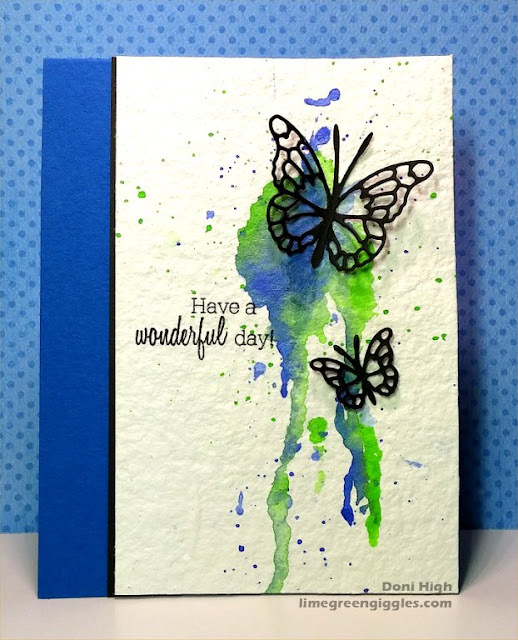 The black butterflies are so pretty against the bright and pretty watercolor background! I almost ordered this set of butterflies. Now I wish I had. Thanks for sharing this with us at ATCAS! AWESOME! Love the brightness of the colours. Gorgeous Doni!! The black butterflies really pop off the beautiful watercoloured background. Thanks for playing along at ATCAS. Gorgeous! The use of black butterfly is amazing on those colors :) Thank you for sharing with ATCAS!